"The State's extraction of agency fees from nonconsenting public-sector employees violates the First Amendment," the ruling written by Justice Samuel Alito said. "Forcing free and independent individuals to endorse ideas they find objectionable raises serious First Amendment concerns." AFSCME and other labor organizations have argued the fees are collected to pay for grievance filings and collective bargaining rather than political purposes and represented "fair share" payments from workers to cover the costs unions incur for representation. A group of Illinois government workers, however, sued to end the agency fee system, arguing that public-sector unions are inherently political because they affect taxpayer dollars and political policy at all levels. The workers' argument won the backing of the Trump administration, 20 states, and a 5-4 majority on the Court, which said Abood was "poorly reasoned." "Whatever may have been the case 41 years ago when Abood was decided, it is thus now undeniable that ‘labor peace’ can readily be achieved through less restrictive means than the assessment of agency fees," the majority opinion said. "The First Amendment is violated when money is taken from nonconsenting employees for a public-sector union; employees must choose to support the union before anything is taken from them." The decision was met with animated dissent from four Democratic appointees on the Court. Justice Elena Kagan said the 1977 Abood standard was appropriate for preserving workplace harmony. The Court's four Democrat-appointed justices warned that the ruling would lead to workers using the First Amendment as a weapon in the courts and would have "large-scale consequences" for collective bargaining in the workplace. 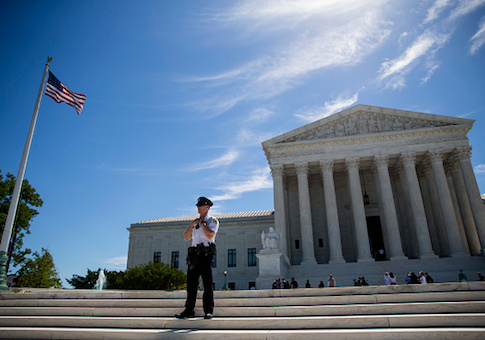 "Public-employee unions will lose a secure source of financial support," the dissent said. "Across the country, the relationships of public employees and employers will alter in both predictable and wholly unexpected ways." The majority dismissed those fears pointing to right-to-work states and the federal government. These employers have not suffered any more tumult than any other part of the country since Abood was decided. The justices also dismissed the idea that unravelling compelled union fees would undermine the power of unions. "Experience shows that unions can be effective even without agency fees." Unions have been anticipating the end of forced dues for years. The Supreme Court deadlocked on a similar case, Friedrichs v. California Teachers Association, in 2016 following the sudden death of Antonin Scalia. When the case was first filed in 2014, the California labor giant circulated a report titled, "Not if, but when: Living in a world without Fair Share," to local leaders anticipating defeat before the High Court. Pennsylvania AFL-CIO president Rick Bloomingdale told the Washington Free Beacon the labor giant's public-sector leaders have been contacting agency fee payers in an attempt to woo them into becoming full dues paying members. He estimates that government workers make up one-third of his members and does not expect an exodus of fee payers following the decision. "We've seen good outreach to our fee payers to explain the benefits of unionism," he said. "It's going to hurt, but it's not going to crush us. As long as people want to organize we'll be organizing." The National Right to Work Foundation, which represented Mark Janus, the plaintiff of the case, praised the ruling. The organization's president, Mark Mix, called it a "landmark victory for rights of public-sector employees." It expects the debate over the issue of forced unionism to continue as unions fight to maintain membership levels. "While this victory represents a massive step forward in the fight to protect American workers from forced unionism, that fight is far from over," Mix said in a statement. "Union officials and their allies in state government have already taken steps to prevent workers from exercising their rights under the Janus decision…. While we celebrate today’s decision, there remains much work to do to both enforce and expand upon this historic victory over coercive unionism."